Except that any fashioner or overseer of military and civilian threat analysis could never swear to anything in a court of law or during a Congressional committee hearing, because he would invariably perjure himself. So he would hedge behind a well-rehearsed litany of presuppositions and assumptions. Continuing a column on “Our Ignorance” from Stephen Coughlin’s Catastrophic Failure: Blindfolding America in the Face of Jihad (pp. 443-484), from Institutionalized Ignorance of Islam, I will focus here on the rendering of language and words to meaninglessness by Army writing guides discussed by Stephen Coughlin in “Our Ignorance.” I thought a Socratic exposition of the subject would better drive home the point over a straight narrative. In a fictive, imaginary setting, a House or Senate committee hearing member, identified here as the Interrogator, in full possession of his faculty of reason, might challenge the “expert witness” about what he knows and what he claims he knows – or doesn’t know. The hearing has been convened to examine the reason why the nation’s “War on Terror” has not prevented the commission of terrorist acts in the U.S., and is in general ineffectual. Witness: Our recommendations and conclusions are then forwarded to the next echelon of threat assessment evaluation with the best assumptions and presuppositions underscored and emphasized, which subsume all possible likelihoods and scenarios concerning the enemy’s next activity. Our highly combed assumptions and presuppositions have played no little role in projecting anticipated enemy activity, and enabled us to counter hypothetical but very significant threats. Often, facts play a role in the final assessment. The Interrogator replies: Assumptions and presuppositions are not admissible evidence, sir, neither as sworn testimony nor in depositions. We need to know why our counter- and anti-terrorism efforts have been salutary failures. You have already acknowledged that they are failures. Please state facts. Facts constitute evidence, not suppositions, presuppositions, or assumptions. Witness: As I know them? As I see them? Interrogator: No. As they are. You say facts often have a place in a final assessment. Shouldn’t they always? Shouldn’t they be the center point in any assessment, forecast, or prediction? Witness: [Scoffs in reply] Begging your pardon, but we can’t be sure that they are factual. We can only assume or suppose that they’re raw, unrefined approximations of things as they really are, which we, as human beings susceptible to error and fallibility, can't know. That’s what facts are. This is especially true…I mean, applicable…concerning human actions and psychology. We in the services – or in the FBI, and the CIA, or DHS, or the Pentagon, and so on – are proud to admit that we don’t pretend to know anything. Anything at all…about this, I mean. Interrogator: About who or what causes terrorism? So, you’re saying you can't know the truth, because facts are finicky, Heraclitean things, you can't depend on them to be true all the time? Witness: [Blinks in confusion.] Excuse me, sir? Interrogator: Heraclitus, a pre-Socratic philosopher. He claimed that things are never the same from moment to moment. Like a river. That’s a Heraclitean notion of yours, claiming that facts only occasionally play a role in your assessments and have little or no bearing on the truth. You insinuate that truths are chimerical. You have little use for them. Witness: Well…It’s true about our not knowing everything about terrorism. Interrogator: Are you certain of that, sir? Would you swear to that? Honestly, sir, you should be embarrassed to have such a position, while I find it disgraceful. [Grins, and shakes his head.] Never mind. Go on. Witness: It’s a complicated issue, a frustrating task. There are so many variables, and motives, and causes, and interpretations. It’s very difficult to fix a vector on motives or to triangulate causes, often impossible to, although it’s our job to. But we can't pin terrorism on one single cause. It’s unfair and highly presumptuous to blame Islam or ISIS or other jihadist organizations for terrorism. It is policy that any analysis submitted by a subordinate that relies exclusively on Islamic motives and perverse interpretations of Islam is symptomatic of Islamophobia. The subordinate is then either disciplined or removed from the program and transferred elsewhere. Interrogator: I think, sir, that had we relied on your assessment of Japanese strengths and intentions after Pearl Harbor, we would still be fighting that war, or lost it. Witness: I am sorry, sir, that you have such a low opinion of our work. Interrogator: As am I. Sir, I have here a Qur’an, which I have read almost in its entirety and in which I have attached Post-its to pages that contain what are called “violent verses.” That is, the ones that call for killing or enslaving non-Muslims, encouraging brutal and bestial behavior towards non-Muslims, and in general waging war on them. And, by extension, on us. [Interrogator holds aloft a Qur’an, then puts it down.] I asked my staff to cull those verses from the Qur’an and print them out for easier reference. There are about one hundred and sixty-four or sixty-five such verses, out of a total of over six thousand verses. These violent verses, which are quite explicit in their wording and intent, and, I have read, are frequently linked to verses, anecdotes, or Sunnah in the Hadith. [Interrogator picks up a sheaf of paper and wafts it in the air.] This is the printout of the violent verses. I have had a copy of the printout made for you. [Indicates to a committee clerk to give the Witness the printout.] The Hadith will not be a subject of discussion here, although I voice my own assumption that you and members your unit, sir, are more familiar with the it than I wish to be. And, it should go without saying, with the Qur'an. Witness: [Giving a cursory glance at the pages handed to him by a clerk.] Thank you, sir, for the pages here. Many of the verses listed here I recognize instantly. But they have all been mis-interpreted all out of proportion to their original intent. They have nothing to do with Islam. Interrogator: [Scoffing with incredulity.] The terrorists beg your pardon, sir, but in virtually every instance of terrorism in this country, regardless of the organization, the perpetrators have either quoted one or more of these verses, or it was learned that they had been cued or prompted by certain of these verses. They have everything to do with Islam. That is a fact. Moreover, the violent verses, I have read from authorities and scholars on the subject of the Qur'an, abrogated or replaced earlier ones that were more in line with the Judeo-Christian ethic of kindness, tolerance, and forgiveness. Witness: Misinterpretations of these verses separate the terrorists from the authentic Islam, sir. We do not formulate our analyses and hypotheses on what is in the Qur'an. That is distinctly against overall policy. We construct our analyses based on how we think many of the verses have been misconstrued by terrorists. Interrogator: You don’t take the violent verses literally, as they were written? Witness: No, sir. That would be against policy. It would be in error. We look for individualized interpretations unique to a person to formulate a threat analysis based on what we think is or was meant. Witness: I can understand your confusion, sir, but I see no point in introducing levity into this discussion. Witness: I don’t know, sir. We have put together some very unfunny scenarios based on our projected moves the enemy might make. Interrogator: I’m sure you have. But, taken altogether, sir, when you read these verses, and see that they conform to the actions taken by the terrorists, and to what their stated and iterated overall goal is, which is to impose Sharia or Islamic law on non-Muslims or unbelievers, to establish a Caliphate in this and in other countries – is that what is called in your circles a doctrine, or a philosophy of war? The verses cannot be taken to mean anything other than what they literally say, at face value, at face meaning. The doctrine is there in plain sight. What stops you from formulating a reciprocal doctrine, one that has the virtue of working, and which is based on reality, and not on what one expert on this subject – I believe his name is Stephen Coughlin – has called a pseudoreality? That is, with a projected threat analysis that does names the enemy and is based on facts, on reality? It seems to me that the simplest policy of your department would be to take the terrorists at their word, and formulate an answering doctrine. Wouldn’t you agree? Witness: It isn’t as simple as that, sir. There are other considerations to take into account when refining a threat analysis to send up the pike. Interrogator: [A moment passes.] Tell me, sir: Are you happy with that situation? With your work? By that I mean that in large part your analyses only occasionally employ facts, and that they are what can only and loosely be called fabrications and excursions into pseudoreality, on which our national security and so many lives depend? Are you satisfied that you are adhering to your oath to defend this country? The Witness remains silent, but is obviously uncomfortable. He looks away from the dais. The Interrogator repeats his questions. The Witness remains silent. Looks around the chamber with a stubborn expression. Interrogator: You may plead the Fifth if you are reluctant to answer, sir. [Laughter in the chamber. He adds another remark.] You may avert your eyes and your mind from the questions, sir. I believe a great philosopher called such behavior “blanking out.” I think we are finished with you here. The Interrogator turns to other committee members, and asks if any of them have questions for the Witness. The others shake their heads. Interrogator: The committee is finished with this Witness. He is dismissed. The hearing will take a fifteen-minute recess, and reconvene to hear our second Witness. The captain leaves hastily amidst a general hubbub, brusquely refusing to answer reporters’ questions and queries from some of his colleagues, and hurriedly exits the chamber. When the hearing reconvenes, a new Witness, a first lieutenant in the same Army counter-intelligence unit, is seated at the table. After he is sworn in and identifies himself, and advised of the seriousness of his testimony, including the consequences of perjury, he recounts his career service, and at the end makes an opening statement. Interrogator: We shall see about that. And what document is it, sir? Witness: It is the Joint Operation Planning manual, Joint Publication five-point-naught, issued by the Joint Chiefs in August 2011. Interrogator: Has it been updated since then? Witness: No, sir, not since October 2010. I have brought copies of it for the committee to peruse. [The Witness asks a clerk to hand the Interrogator and other committee members the copies. This is done. The Interrogator leafs through the manual. He exclaims.] What a morass of mealy-mouthed bureaucratese! [Continues leafing through the manual. Stops.] Ah! Here’s an interesting term, “Center of Gravity,” or COG. Sir, would you mind reading that aloud for the record? 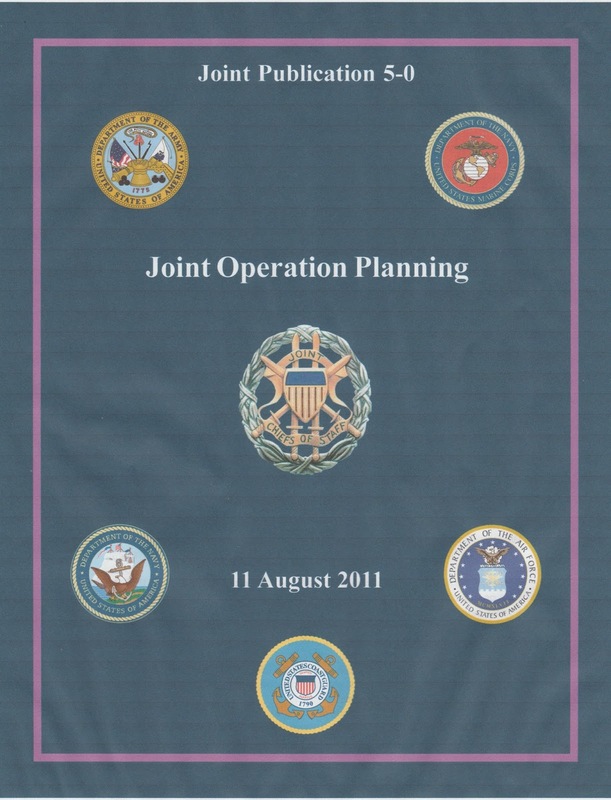 It’s under “Executive Summary, Elements of Operational Design,” Roman numeral page x-x-i. Interrogator: Thank you. COG. The “Center of Gravity.” Sir, would you say that was descriptive euphemism for a doctrine? It covers all the essentials of understanding one’s enemy’s means and ends. Witness: In the short-term, yes, I would call that a doctrine. The term “moral strength” I think is a discreet term for a doctrine unique to Islam, or a prudent reference to it. Interrogator: I agree. Say, rather, it is a singularly circumspect term for Sharia. [He leafs through the manual.] Also, I notice that the preferred term throughout is “adversary.” Is “enemy” too strong a word for whom they’re discussing? These are generals, war-fighters. [To himself.] Maybe they’re better golfers than they are generals. Witness: I noticed that, too. I can't answer your question, sir. Interrogator: Now, on to what you wished us to focus on. Witness: Please direct your attention to Roman number Part Four, pages seven and eight, on the section on “assumptions.” The wording in the 2011 edition is similar to that of the 2010 and 2006 editions of the manual. It is under the heading, “Determine Known Facts and Develop Planning Assumptions.” The differences in wording are slight. I think this is important to bring to your attention. The term “assumption” occurs numerous times throughout the manual. But in the discussion of assumptions on the cited pages, there is a serious qualification which I think merits your attention, as well, because it affects every statement in the manual that employs the term. Interrogator: [He has found the page and reads it.] I see what you mean, sir. Please read it aloud for the record. Interrogator: I see what you mean, sir. “Assumed to be true in the absence of facts”? That is an astounding confession of moral and cognitive decrepitude. Just because a general says so, you’re to go ahead and implement his plan which is based on an absence of facts?? Just on his say-so? On his gussied up, three-star conjecture? It’s curious that the statement is highlighted in bold. [Pauses.] How often do you subordinates challenge the assumptions of the higher-ups? Interrogator: [With other committee members, turns to the Glossary. The Interrogator scans the entry.] Please read it for the record. Interrogator: An “absence of positive proof”?? [Shrugging, and gesturing with his hands.] But, it means the same thing as an “absence of facts”! It just isn’t as starkly brazen a way of saying the same thing. It’s what Mr. Sheridan would call “puffery.” But I’m not sure right now which category the phrase would fit into. I may have to invent a new one. Interrogator: [Waving a hand.] Never mind. I was thinking of that play, The Critic. Tell me, sir: How often do you review assumptions to check their validity? Witness: Too often, sir. It’s like a dog chasing its own tail. Nothing ever comes of it. However, our commander discourages reviews. Interrogator: You have my sympathies. [Studies the Witness for a moment. He snaps the manual shut.] If it pleases the committee, I would like to adjourn this hearing until tomorrow. I need to take this document home to read and examine more closely. I would advise the committee to do the same. We should reconvene at ten a.m. [Addressing the Witness.] Sir, please make yourself available to continue your testimony. Thank you for your illuminating insights. I’m sure you have many more to convey. Witness: Yes, sir. I do. Interrogator: This hearing is adjourned until ten a.m. tomorrow. Many thanks to Stephen Coughlin for the chance to pen this brief drama. 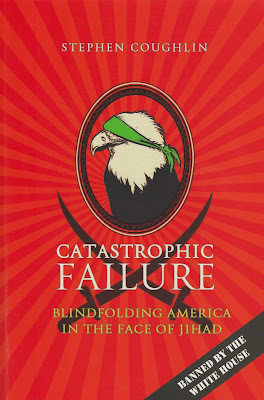 Catastrophic Failure: Blindfolding America in the Face of Jihad, by Stephen Coughlin. Washington DC: Center for Security Policy Press, 2015. 788 pp. I commented on a Daniel Greenfield FrontPage column of December 24th, “Muslim Immigration is Exactly What ISIS Wants.” In it, Greenfield argues that ISIS wants to send thousands of its “fighters” to Europe and especially to the U.S., for the purpose of establishing operational bases for terrorism. Agreeing with everything said by Mr. Greenfield concerning ISIS's tactics and overall strategy, a crucial question is: Because Obama wants to bring in tens of thousands of Muslim "refugees," and knows damned well there will be scores of ISIS agents among them, is this what he wants? Is he acting as an agent for ISIS? …I can posit an answer, but this is a question which would naturally occur to anyone observing Obama's actions and statements. And that has been over the years, at least seven of them. In June 2008 I penned a five-part commentary on the rise of Barack Obama, “The Year of the Long Knives,” which is accessible here. (That series does not mention Islam or Muslims even once. It dwells chiefly on the mooning crush on Obama our decrepit “aristocracy of money” has exhibited.) In this column I am positing an answer. It is purely speculative. If it smacks of a “conspiracy theory,” so be it. Because, after all, what exactly is a “conspiracy”? It is a plan, a long-range one, featuring many shadowy co-conspirators and their dupes and dogberries, together with secret funding and a knack for devious dissimulation. The term “conspiracy theory” has garnered the dubious distinction of being the exclusive preserve of garden variety kooks and of men who wear aluminum foil hats to better communicate with the aliens who are working with the Rosicrucians allied with the Elders of Zion to take over the earth. “…a tremendous amount of raw data. We denature it, break it into data bits, and pour it into a soft-science mold….The data on which our understanding is should have been based now serves only to buttress whichever theory is in vogue.” (p. 453). In short, the conspiracy theory may be rich in details but have no credible, realistic structure. It may be a thousand-piece jigsaw puzzle of blanks on which one can spray-paint any image but that of Islam. However, there is a conspiracy afoot – one that has been walking the walk for many years – perhaps not even beginning with the Muslim Brotherhood’s description in the 1991 Explanatory Memorandum of how to corrupt and take over America and the West, but even before that, say, in 1928 with the formation of the Muslim Brotherhood by Hassan al-Banna. Or in 1964 with the publication of Milestones by Sayyid Qutb, a Brotherhood member, whose advocacy of an incremental introduction of Sharia law is followed “religiously” by his successors. In Obama’s case, I do not think it is so much a conspiracy with ISIS and Al-Qaeda, with the Muslim Brotherhood, with CAIR, with the ISNA, and with the Organization of Islamic Cooperation (OIC), as it is a simpatico, symmetrical, ideological marriage made in hell. Islam is totalitarian; and hates America. Obama’s leftist ideology is totalitarian, and hates America. The alliance of the Left and Islam is a matter of record. Of course they would exploit each other’s grand plan to bring down America. But I doubt very much there is buried email correspondence or communications between the White House and, say, Abu Bakr al-Baghdadi, the leader of the Islamic State, or anything like Hillary Clinton’s surreptitious emails over Benghazi and her hidden bathroom email server. So, I don’t think Obama is our “Islamic Candidate,” in the way of the half-witted character in 1962’s The Manchurian Candidate. He was the garrulous, buffoonish husband, John Yerkes Iselin, played by James Gregory, of the power-lusting mistress of manipulation, played by Angela Lansbury (any resemblance in character between Mrs. Eleanor Shaw Iselin and Hillary Clinton is startlingly appropriate). She plotted to have his presidential running mate assassinated by her own son so her husband could take his place as the presidential candidate and very likely win the White House, where she would be the power in the Oval Office. Obama, however, is not a half-wit; he knows what he’s doing. He has stayed the course of his collectivist agenda ever since entering politics. He’s shrewd, deceitful, glibly articulate, and a master of insouciance. That is my kinder description of him. But, is he Putin’s poodle? Bill Clinton’s gofer? Hillary Clinton’s whipping boy? George Soros’s puppet? Or Islam’s useful idiot? 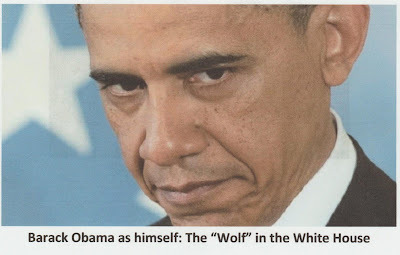 Or is he just a “lone wolf” executive jihadi? I can’t think of a single policy action of his, including the immigration issue, that hasn’t if not immediately benefited the advance of Islam, later came home to roost. So, is what ISIS wants, what Obama wants? Those reams of unintegrated data possibly presented to him in his morning security briefings – which Obama may or may not take seriously or even bother to read – must inform him of ISIS plans to infiltrate into the country with hordes of Syrian “refugees,” and across the border from Mexico. If we, the public he wishes to deceive, are aware of these facts, can he not be, regardless of the accuracy and truth, or lack of such, in the information presented at his briefings? How can Obama not know what is going on? I would say, yes, he knows. He has met with prominent Muslim figures overseas – who knows what was said between him and them behind closed doors? – when he met with Saudi kings and when he met with officials at Cairo University in 2009 and delivered his pro-Islam speech. His foreign policy agencies are top-heavy with “moderate” Muslims, all vetted with so-called security clearances. There are probably more Muslims in Obama’s administration than there were Communists and fellow travelers in Roosevelt’s. This cannot be as simple an issue of politically correct hiring policies – “we mustn’t be beastly or discriminatory towards harmless American Muslims!” – but rather a signature characteristic of Obama’s administration. The ritualistic “Why do they hate us” browbeating favored by the chattering classes is nonsense. Al Qaeda hated us because we were not Muslims. But it was only using us as the hated “other” to consolidate a collective Muslim identity. We are to Islamists what the Jews were to Hitler; a useful scapegoat whose otherness can be used to manufacture a contrasting pure Aryan or Islamic identity…. No dialogue is possible with an ideology whose virtue is premised on seeing you as utterly evil…. ISIS doesn’t plan to defeat America through acts of terrorism. The plan for defeating America, like every other country, Muslim or non-Muslim, is to build a domestic Muslim terror movement that will be able to hold territory and swear allegiance to the Islamic State…. If Obama was ever Muslim Brotherhood friendly – and he certainly hailed the triumph of Mohamed Morsi and the Brotherhood in Egypt, and even, with Hillary Clinton, contributed to Morsi’s rise, albeit it lasted only a year – he had to have had knowledge of the Explanatory Memorandum. He has to know that the Brotherhood’s overall doctrine, which is identical to ISIS’s, and CAIR’s, and the OIC’s, is to impose Sharia on the West and most particularly on the U.S.
ISIS can’t defeat us with terror attacks. The only hope for an enduring Islamic victory over America is through the rise of domestic groups that pledge allegiance to the Caliphate. ISIS can’t invade America. It has to be invited in. That’s what our immigration policy does. Trump isn’t a threat to national security. 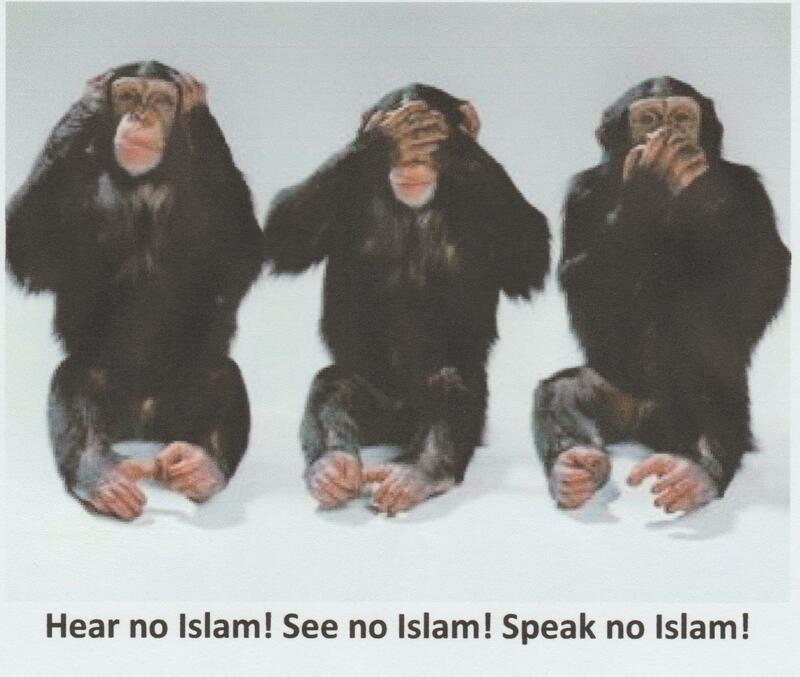 Muslim immigration is…. In terms of imposing Sharia law on the U.S., it is also the hope of the Muslim Brotherhood, the OIC, and CAIR, among all the other Islamic front groups now in the country. The investment banker Robert Wolf first met Barack Obama one afternoon in December in a midtown conference room. Obama was in town to deliver a speech at a charity dinner for children in poverty at the Mandarin Oriental—but also to pursue another, less high-minded, but more momentous, objective: to begin the process of attempting to pick Hillary Clinton’s pocket. The conference room belonged to George Soros, the billionaire bête noire of the right. After talking to Soros for an hour about his prospective bid for the White House, Obama walked down the hall and found assembled a dozen of the city’s heaviest-hitting Democratic fund-raisers: investment banker Hassan Nemazee, Wall Street power Blair Effron, private-equity hotshot Mark Gallogly, hedge-fund manager Orin Kramer. Most had been big-time John Kerry backers in 2004. Most had a connection to the Clintons. All were officially uncommitted for 2008. I have no idea why the author of the article, John Heilemann, would characterize Soros as “the billionaire bête noire of the right,” when Soros is of the global government left. But then journalists from the left usually see any billionaire as a right-wing, knuckle-dragging fascist. And Heilemann has a master’s degree from the John F. Kennedy School of Government at Harvard, which can explain his confusion. Further, it is billionaires like Soros, Bill Gates, Warren Buffet, Mark Zuckerberg, and others who have become the voluble vanguard of global socialism. Yes, national borders are obstacles. Aside from helping define the character of a nation, they also serve the same purpose as fences, doors, windows, and locks, which help to frustrate trespassers, burglars, home invaders, and other predators. It is a nation’s identity that Soros wants to erase. The Shadow Party is always changing. New groups form and old ones dissolve. For instance, America Coming Together -- which raised $135 million for Democrat get-out-the-vote drives in 2004 – has been mothballed, at least for now. The most active Shadow Party groups today are probably the Center for American Progress, America Votes, Democracy Alliance, the New Democrat Network, the New Politics Institute, ACORN and, of course, MoveOn.org. So is Obama. Is this why Soros backed Obama’s run for the presidency? He certainly placed the right bet. 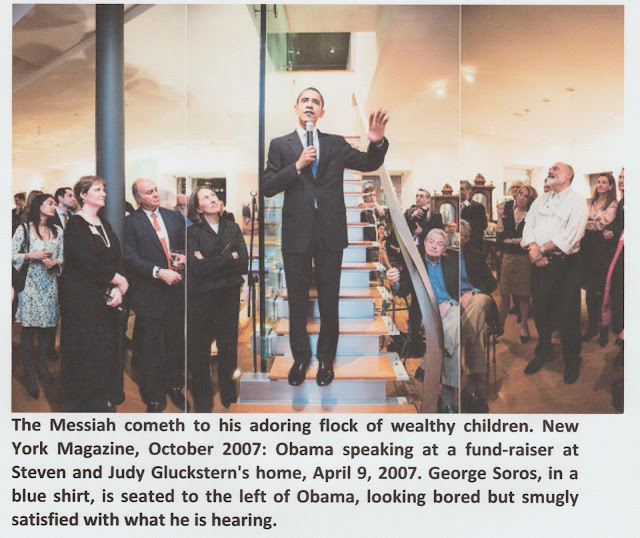 But did Soros also see Obama as an ideal Islamic Candidate as long ago as 2007? Doubtless. Soros’s role in the mass invasion of Europe didn’t show until there was resistance to his “open society/open borders” notion began to manifest itself, especially in Eastern Europe. His tentacles are everywhere. Muslim migrants arriving in Europe are given a ‘migrants handbook’ packed with tips, maps, phone numbers and advice about getting across Europe. The “rough guide” contains phone numbers of organizations which might help refugees. The ‘rough guide’ is written in Arabic and contains phone numbers of organizations which will help refugees making the journey, such as the Red Cross and UNHCR. The “Rough Guide”, being printed and distributed by the Soros “Open Society” group “W2eu” or “Welcome to the EU”, Foundations, has activists handing out these guides for free in Turkey. And how can one account for all the cell phones, tennis shoes, clothing, backpacks, and other personal items carried by the thousands of healthy male “refugees” posing as impoverished Syrians fleeing the chaos of the Syrian civil war, or from Libya, Somalia, and the Balkans? Too likely these were also distributed free by Soros through Open Society or some other NGO he controls. In conclusion, I would mark Barack Obama as every Islamic collectivist’s perfect candidate to help advance Islam in the West and around the world. That may or may not be Soros’s religious cup of tea, but I don’t think it would make any difference to him who or what dissolves the West in the name of whatever fantasy world he imagines the world ought to be. That is the nature of the poisonous, maleficent ball of glop that is Soros’s “soul,” which only a Fyodor Dostoyevsky would have the fortitude to examine in depth. And, because so much of Obama’s past is either closed to scrutiny (e.g., his not releasing much information about his academic career) or off limits to any kind of “shovel-ready” investigating reporting. Only Obama knows for sure whether or not he is “The Islamic Candidate.” And his actions, speeches, and policies over the last seven years are certainly not calculated to discourage the idea. A typical modern critic was as likely to grasp or report the substance of a book – good or bad, and whether or not he liked it or approved of it – as it was that a chimpanzee would appreciate a thermometer. He’d worry it, nibble on it, look through it, try to clean his ears with it, or use it to fish for maggots. In October 2014, Mark Tapson published on FrontPage a review of an online document which qualifies as an enemy’s threat doctrine. It was reprinted on The Counter Jihad Report. By that Naji doubtless meant a planet that has been conquered by Islam, scoured clean of all unbelievers, with the Ummah lording it over what few recalcitrant infidels have survived, all the others having been made extinct. What astounded many was the unabashed endorsement of such savagery as a military policy by Naji. Tapson reveals the “stage” or “phase” policy of Naji’s overall strategy. It comports with Stephen Coughlin’s insistence, in Catastrophic Failure: Blindfolding America in the Face of JIhad, that to effectively fight the enemy, one must first grasp and integrate into one’s own warfighting doctrine a sound knowledge of that of the enemy. A PDF copy of The Management of Savagery can be found here. On the other hand – on the side of Western civilization – we can also cite John David Lewis’s Nothing Less Than Victory: Decisive Wars and the Lessons of History, published in 2010, in which Lewis stresses throughout that victory over an enemy must move from demoralizing him to causing him to concede defeat and surrender. I reviewed this important work in 2012 on Rule of Reason. But to accomplish the demoralization, the loss of will to fight, and concession of defeat in an enemy, the enemy’s total doctrine or ideology must be understood trunk, root, and branch. This is a policy our current intelligence and military communities refuse to adopt from a politically correct notion that do so would offend the enemy’s sensibilities and reflect,” among other things, “Islamophobia,” probably racism, and the hubris of “imperialistic superiority.” Nazi Germany and Imperial Japan, writes Lewis, were not defeated until they felt they were defeated. It took two atomic bombs to wring a surrender from Japan. And there is evidence that Nazi Germany was crying uncle before American tanks were rolling into Germany. But FDR, in apparent accommodation to Josef Stalin, brushed off German High Command overtures to sue for peace to allow the Soviets to “share in the glory” of defeating Germany and also to allow them to gobble up half of Germany and most of Eastern Europe. See my three Rule of Reason reviews of Diana West’s American Betrayal: The Secret Assault on Our Nation’s Character here, here, and here in which she offers that evidentiary hypothesis. Stephen Coughlin, in Part VIII, “Our Ignorance,” of Catastrophic Failure: (pp. 443-484), dwells on the depth and nature of our ignorance of our Islamic enemy. But suppose that ignorance is a consequence of a policy that favors the postmodern mantra that true, incontrovertible knowledge is impossible. While reading “Assumptions, Presuppositions, and Fraud” in Part VIII, “Our Ignorance,” I suddenly recalled something from my early philosophical readings. In a critique of Immanuel Kant’s Critique of Pure Reason, in which he argues that we can't know reality – or the “real” reality because our minds’ subjective senses distort what we see – one thinker proposed, as a counter argument, that if that is true, then Kant must include his own book, and the words in it, which would lead one to conclude that Kant’s pretzel-like, brain-disabling assertions are pure gibberish. If what we see on a page doesn’t reflect the “real” page or even the words on it, what are we unable to see? The unprovable. The indemonstrable. The nonexistent. Had that logic ever occurred to Kant? Would he concede or not that the “truth” of his assertions, by his own hypothesis, was no more provable or valid than anyone else’s? That the book in our hands and the words in it were but the distorted products of our inadequate sense organs? Kant’s was the ultimate philosophical con, using the “stolen concept” of “reason” and the demonstrable evidence of his books and words to put over an attack on the Enlightenment, which he opposed. Unfortunately, Kant continues to exert a powerful, tenacious, and destructive influence in Western culture today. This I particularly true, as I can see, in Coughlin’s description of how analysts must assume that what they think they know is just subjective, baseless suppositions and assumptions “in the absence of facts” – which Kant declared are unknowable, a claim with which the threat doctrine designers and enforcers seem to agree, whether or not they have ever heard of Kant. Coughlin then discusses some doctrinal practices and fallacies. In the War on Terror, it is incumbent on us to incorporate stated jihadi motivations – as the jihadis express them – into our threat doctrine. Unfortunately, when such an analysis is done, it doesn’t support the preferred explanation of our senior civilian and military leaders. When they contemplate the actions of the enemy, they ascribe a completely different motivation to him – generally expressed in terms of “violent extremism,” usually in furtherance of “underlying causes” – that is invariably based on behavioral models that service blue expectations. Coughlin asks some important questions about why our strategy against jihad is so irrational, incoherent, and ineffectual. Al-Qaeda? The Muslim Brotherhood? The Organization of Islamic Cooperation (OIC)? CAIR? The ISNA? The ICNA? President Barack Obama? Obama has shown that he is reluctant to charge Islam with any doctrinal responsibility for terrorist acts committed in this country. Or anywhere else, for that matter. He has simply perpetuated President George Bush’s narrative that Islam has been “hijacked” by terrorists, to be sure, but by terrorists who have purportedly misinterpreted Islam or put a perverted meaning on the Koran’s many violent verses – that is, on the verses that abrogated the earlier, banal, non-violent verses. 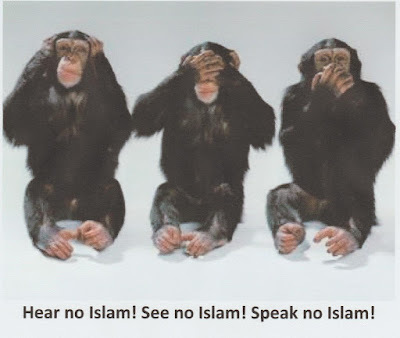 And if no doctrinal responsibility can be attached to Islamic terrorism – if Islam and Sharia cannot be named in any threat analysis or by the FBI or by military intelligence – then, indeed, everything and nothing can be held responsible, and the issue sinks into a thousand-tentacle mishmash of theoretical but unknowable causes. Coughlin has no use for “complex” threat models. 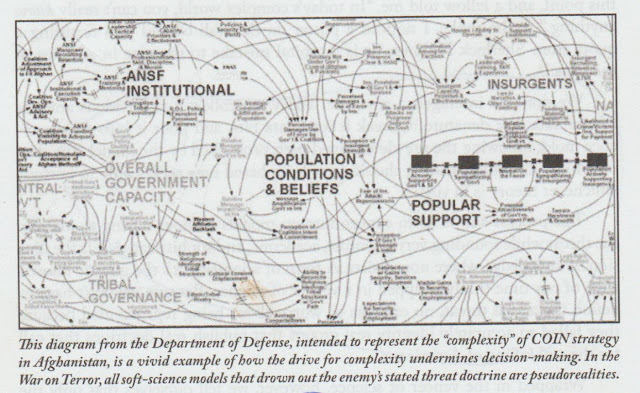 An enforced allegiance to “complexity,” he argues, only hamstrings threat analysts in their jobs. They are expected to produce answers that resolve nothing but abstractions that are not anchored to reality – or to the enemy. A Jackson Pollock painting of drips and smears and blobs may be said to be complex, but does it mean anything? You can attach any meaning you wish to one of his canvases – everything but madness. That would be offensive to Pollock and his followers, and indicative of a phobia for abstract art. But a rational observer would say: Pollock doesn’t “do” art. Coughlin would likely agree with that prognosis. We don’t do intelligence anymore. Today, we collect a tremendous amount of raw data. We denature it, break it into data bits, and pour it into a soft-science mold, following the pre-determined path prescribed by the model. The data on which our understanding should have been based now serves to buttress whichever theory is in vogue. I think we're lucky that our current echelon of threat analysts have not yet projected an Amish jihadi assault on a Lancaster, Pennsylvania mall by driving their horse-drawn buggies on the sidewalks to mow down shoppers, or Pentecostal jihadis wearing suicide vests assaulting a packed Mormon temple. But, then again, the equally ethereal scenarios they are projecting have nothing to do with Islam, either, even though the Islamist supremacists say it has everything to do with Islam. But given the preference for what Coughlin calls a pseudo-reality that allows the analysts to duck and dodge Islamic jihad, it’s only a matter of time. If you could imagine the three monkeys rolled into one, you’d have a consciousness that was conscious of nothing, as a matter of choice. The insensate monkey doesn’t “do” reality. And you can't ask him how long he expects to remain alive in that condition. You won't get an answer because he can't hear or see you. To him, you, the individual anchored in reality, don’t exist.